Advanced Eyecare Professionals (AEP) is hosting their 5th annual golf scramble fundraiser to support their annual Community Eyecare Week. This years golf event will be at 9am on Saturday, May 18, 2019 at Arrowhead Golf Course in Lowell, Michigan. The charity golf event supports AEP’s Community Eyecare Week, that helps those in need of vision services locally who could not otherwise obtain adequate eye care. During Community Eyecare Week free eye exams and prescription eyewear are provided to children and adults who need glasses and can’t afford them. The outreach is for Hastings, Ionia, Lowell, and the surrounding communities. AEP’s doctors and staff will be donating their time and resources to help those in need. The charity golf scramble fundraiser and sponsorship proceeds go 100% toward Community Eye Care Week patients and those in need throughout the year. Community Eyecare Week was established in 2007. With the support of generous donations from community business owners, individuals, and clubs and organizations; AEP has had the privilege of helping 483 patients receive free eye exams, provided 285 patients with a free pair of glasses, and also continue to work with many of those patients’ to care for their ongoing medical eye conditions. For those looking to be patients for AEP’s Community Eyecare Week please submit a form at AEPeyecare.com/CEW and/or call AEP and mention Community Eyecare Week for qualification details (269-945-3866). The charity golf fundraiser will feature multiple teams of four people playing 18 holes, with a cart, fun golf contests with prizes, and a following lunch. 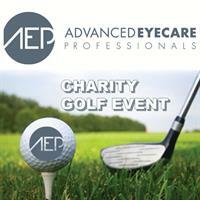 To sign up a team, individual golfer, or to become a sponsor, visit AEPeyecare.com/GOLF. The deadline to play or sponsor is May 13th, 2019. Have fun giving the gift of sight, with 18 holes of golf and a meal!